Shampoo Amla - eclipta Alba not only cleans, but nourishes and moisturizes the hair. This shampoo is enriched with Amla, Ritchey, eclipta Alba and henna. - Amla stimulates hair growth and prevents hair loss. Amla is traditionally used in India for the treatment of hair, improves blood circulation and supply of oxygen, nutrients to hair roots, normalizes the sebaceous glands. Thanks to the presence of vitamins and minerals, is a natural conditioners, prevents early graying of hair is regenerative means in the case of split ends, brittle hair, hair, weakened by Perm or dyeing. - Sesame oil moisturizes and nourishes the hair. - It is effective against dandruff and gives hair smooth and silky. Henna – strengthens the hair, making them strong, and it is a known remedy for dandruff and seborrhea. The stimulating properties of henna make it the best remedy for any hair loss, including seasonal, hormone-dependent, caused by stress or intoxication of the scalp. - Eclipta Alba has long been famous Ayurvedic remedy for hair care. Promotes hair growth, revitalizes hair follicles, stops hair loss, helping even the most hopeless cases. In addition, the eclipta Alba prevents premature graying of hair and reduces gray hair. Nourishes the scalp with precious minerals and other nutrients, gives hair Shine, volume and healthy appearance, making them more supple and elastic. Returns the strength of brittle, dry and damaged hair. Ideal for normal to fragile, brittle hair. Content: Amla, Almond Oil, Reetha, Bhringraj, Harathki, Heena, Neem. 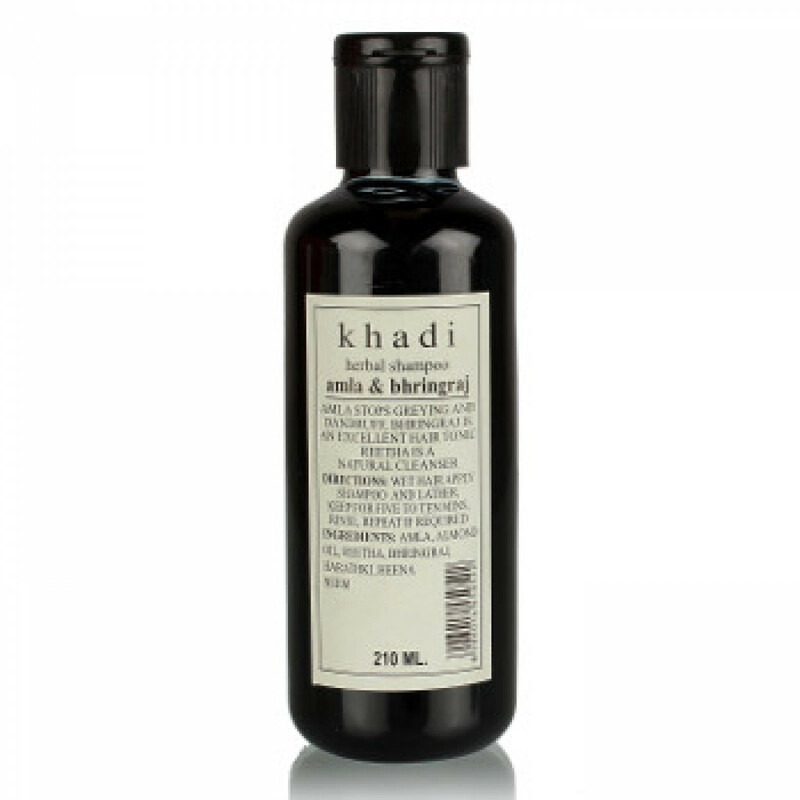 Khadi shampoos do not contain sulfates or parabens. Application: For best results, shampoo is recommended to use twice. Apply a small amount of shampoo onto hair, massaging the scalp to wash hair then rinse with shampoo. When you first use the shampoo, almost no foam. The second time the shampoo gives a rich foam which should hold on the hair for 5-10 minutes. Original name: Amla & Bhringraj shampoo Khadi. In our store You can buy authentic Shampoo Amla Khadi the eclipta Alba at a bargain price!